We believe PE and Sport plays an important role in realising our vision of Inspiring belief in God and in one another, a reality for every pupil, with the potential to change young people’s lives for the better. Through PE and Sport our children learn to develop the important qualities of discipline, resilience, communication, teamwork and ambition which lead to improved concentration, attitude and academic achievement. St. Richard’s is dedicated to promoting healthy and active lifestyles and to providing a wide range of Physical Education and sporting opportunities for all of its pupils. 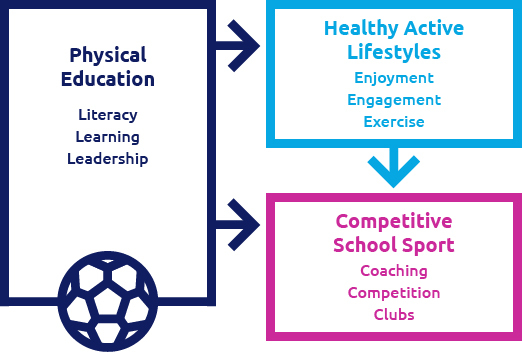 The PE and Sport Premium is being used to develop PE Leadership and provide additional sporting opportunities for all pupils. At St. Richard’s, sport is encouraged through extra-curricular activities at lunch and after-school. Activities offered are martial arts, football for boys and girls, tennis, golf, gymnastics and dance. All clubs are heavily subsidised to make them available for all and children are consulted about the types of activity they would like to participate in. The PE and Sport Premium has increased the engagement of both staff and pupils in PE and Sport. Teachers focus on raising pupils’ achievement and developing multi abilities in their PE lessons. The school also strives to ensure through its rich provision, that children engage in physical activity for at least 30 minutes each day, as per the 2016 government initiative to reduce childhood obesity. The PE and Sport Premium funding was used to increase the opportunities for children to participate in activities at lunch time and after school. It was also used to purchase bikes and scooters for EYFS and Key Stage 1. We are very proud to have been awarded the Sainsbury’s School Games Gold Award for 2014/15 and the Silver Award for 2015/16 and 2016/17 for our continued dedication and commitment to the development of sporting competition across our school.